Many beer clarifiers are available for use in the boil kettle. We prefer to use Whirlfloc tablets (shown in picture). Almost everyone who tries Whirlfloc tablets prefers them to regular Irish Moss. Add for the last 15 minutes or so of the boil (timing is not entirely critical). One tablet is good for 10-15 gallons of wort. We typically always brew 10 gallon batches so one tablet is perfect. Use half a tablet for 5 gallon batches, though there's nothing wrong with using a full one (they're a pain to cut in half). Whirlfloc is a blend of Irish Moss and purified Kappa carrageenan that encourages the precipitation of haze-causing materials such as proteins and Beta glucans prepared in a quick dissolving, highly soluble tablet form. 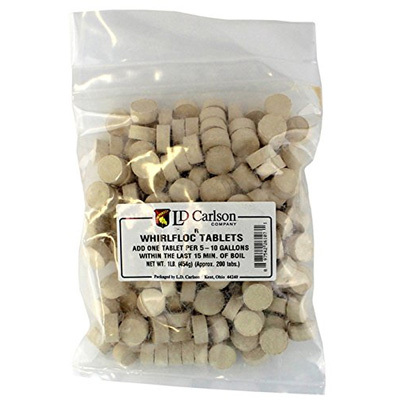 It's best to use up Whirlfloc tablets within a year or two of purchase, so don't overstock.